On Remembrance Sunday we commemorate the contribution of British and Commonwealth military and civilian servicemen and women in the two World Wars and later conflicts. November 11, 2018 also marks the 100th anniversary since the end of the First World War, Armistice Day. Of course, we must never forget those who gave their lives in service to our country. We especially owe a great debt to all those who helped to save this country – and the rest of Europe – from the terrible onslaught of the Nazi regime in the Second World War. But as well as remembering all those who fought so hard and valiantly during times of war and conflict, we should also remember all those who worked so hard and valiantly to help to avoid wars and conflicts. 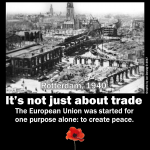 The European Economic Community – later to be called the European Union – was started in the aftermath of the Second World War with one purpose and one purpose alone: to avoid wars on our continent ever happening again. (Article continues after 4-minute video). That was the passionate resolve of those who are regarded as the eleven founders of the European Union, including our own war leader, Winston Churchill. After all, Europe had a long and bloody history of resolving its differences through war, and indeed, the planet’s two world wars originated right here, on our continent. So the EU was never just an economic agreement between nations. 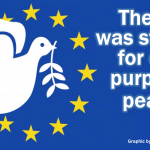 It was always also meant to be a social and political union of European nations to enable them to find ways not just to trade together, but to co-exist and co-operate in harmony and peace on many levels as a community of nations. 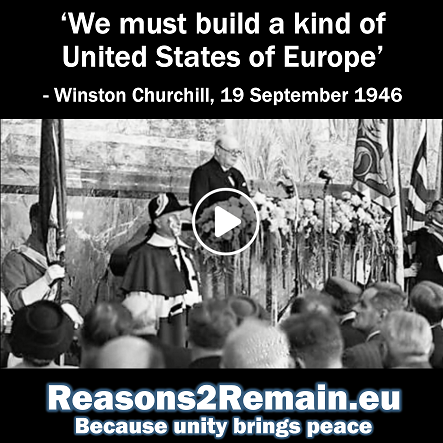 At the time Churchill did not envisage Britain joining the new Union of Europe, but he was later to change his mind. In March 1957 the European Economic Community (EEC) was established by its six founding nations, France, Italy, West Germany, Belgium, The Netherlands and Luxembourg. This was a remarkable achievement, considering that these countries only a few years previously had been fighting in a most terrible war, and four of the founding nations had been viciously subjugated by another of the founders, Germany, during their Nazi regime. In a speech four months later in July 1957 at Westminster’s Central Hall, Churchill welcomed the formation of the EEC by the six, provided that “the whole of free Europe will have access”. Churchill added, “we genuinely wish to join a free trade area”. Maybe this is the point that many Brexiters simply don’t get. Here in Britain we don’t seem to understand the founding purpose of the European Union – and on the rest of the continent, they don’t understand why we don’t understand. The European Union isn’t just about economics and trade, and never was. It’s about peace, and a community of nations of our continent working together for the benefit and protection of its citizens. 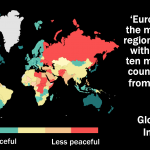 We are now rebuffing our allies in Europe, telling them by our actions and words that the precious, remarkable and successful post-war project to find peace and security on our continent isn’t as important to us as it is to them. Will our friendship and relationship with the rest of our continent ever recover? 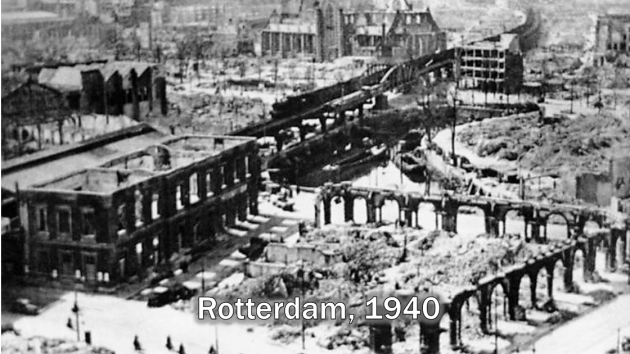 • Photo: central Rotterdam on 14 May 1940 after the bombardment by German war planes. Around 900 people died and vast swathes of the city were destroyed in the bombing. Almost 80,000 people lost their homes when parts of the city became ‘a sea of fire’. Photo: German federal archives via Wikimedia Commons. 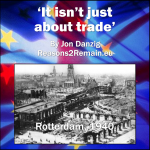 This entry was posted in Current Affairs, Economics & Trade, Politics & Public Policy, The EU and tagged brexit, EU, Europe, European Economic Community, European Union, peace, Winston Churchill, World war. Bookmark the permalink.